JP- While I know DC is keeping generally tight lipped on a lot of the relaunch series, what can you tell us about the new Firestorm? What can the fans expect from the series? EVS- What I can tell you is that Ronnie and Jason are both in it now, both of them are Firestorm. They aren’t half of a Firestorm anymore, although they can fuse and can become a ten-foot tall being of nuclear energy that you will be seeing in issue #1. It is the same natural concept that Firestorm has always had to him, two guys burned into one. I always felt that the idea of me being a young man, all excited to be a superhero, but having a stodgy old professor, who is a wet blanket that ruins everything, stuck in my head at all times. “Ronnie be careful! Ronnie look out!” As a kid, and you go back to this thing where it needs to appeal to kids, that’s my worst nightmare. That isn’t a power fantasy, to be half a superhero with my dad in my head. That’s horrible! But the idea of you two guys (referring to the ComicBooked.com interviewers, Jordan and Nick) being superheroes and being best buddies, to have the ability to, if you were facing a problem that was too big for you, high-five and turn into the equivalent of the Incredible Hulk if he was on fire! That sounds cool, you know? My thanks to William Powell for pointing me in the direction of this interview! Posted in: Comic books, Ethan Van Sciver, Firestorm #09: New 52 v1 (Firestorm Protocols), Firestorm comic vol. IV, Jason Rusch, News, Ronnie Raymond. ← It’s a digital Firestorm – The Nuclear Man comes to comiXology! Sounds pretty cool to me. So if the united “super-storm” is more like the Hulk, does that also mean he is out of control? A 10 foot tall rampaging Firestorm? This series is going to rock! Yesterday at my LCS they handed out a checklist of the 52 DCnU titles coming in September, the first thing I did was scan for Fury of Firestorm and checked it to add to my subs. I can’t wait for it to begin, really feeling the excitement now. I get that they need to sell this new concept, but I’m getting tired of people ragging on the old Ronnie-Stein merger as if Stein was the buzzkill who ruined Ronnie’s good time. Full disclosure: I really haven’t followed comics at all in the past few months. When I was reflecting on when I stopped, I realized that it was the death of Professor Stein in Brightest Day. That kind of killed the enjoyment of comics for me, and while I’m cautiously optimistic about the new trend for Firestorm (NOT, truth be told, for the DC reboot), I wish they’d stop talking like Stein was this boring old guy all the time. I loved that character, and don’t like seeing his memory dragged through the mud like that. I’m a little skeptical about this title and, even though I am a huge fan, have not fully decided if I am going to pick up this title. Looking closer at this cover again: Is it me or does Ronnie-Firestorm looking like Robert Smith after watching Old Yeller with that crazy eye makeup look? so EVS says hes a big firestorm fan ….but wanted nothing to do with the original concept…how does that make him a fan? At all? I’m wondering if this Superstorm isn’t tied to Brimstone somehow. Or, as someone speculated before, the Anti Monitor? It seems like a lot of Dc titles are coming to the end of big disastrous plots…. Either from what titles I read or from the descriptions online. Legion has something big happening with the Legion of Super Villains destroying a bunch of ancient places of power across the universe (including the rock of eternity). Firestorm is set to blow up (and it was hinted that would destroy the universe). Looks like JLA has some big disaster storyline. I feel like there were more that I’m forgetting… could it be planned that these all tie together to cause the reboot? And Brandon… I totally agree with you! @Jeph You nailed it. Alex (Malcolm McDowell). It’s a terrible drawing but you get the idea. I WAS looking forward to the new series. WAS. 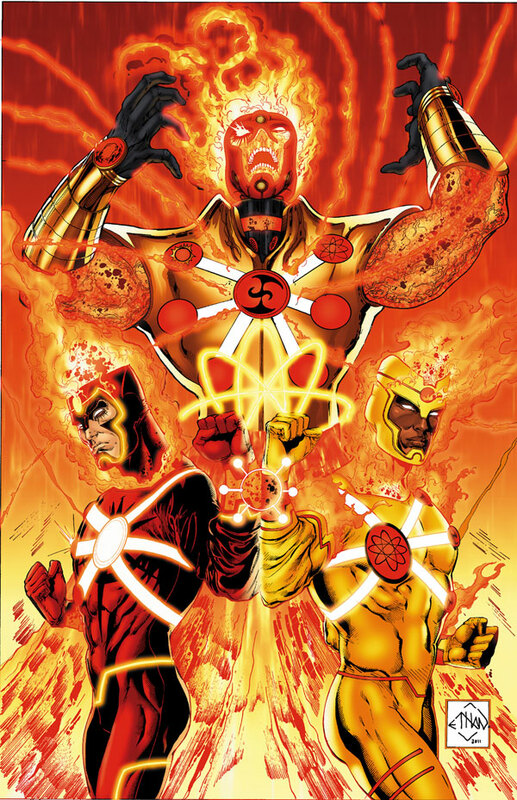 WHY would DC take one thing that makes Firestorm unique–aka merging, two to one… to do this. WHY?! I like the idea of different drivers, different powers, and then, under certain conditions, superstorm… but this… man, I’m don’t know what to think… feels too Wonder-twinny/Power Rangerly… & “best buddies…” where’s the drama in that? Not to mention the Stein bashing–Martin’s father figure advice was useful, powerful, and sometimes ignored–Remember DC, Stein was powerless when he merged with Ronnie.–strong pathos here. In many ways, he represented the reader, who also couldn’t do anything. I’ll still pick up the new series, at least of a few issues. Shag, I hope you’re right on your predictions. And look, DC, stop focusing on “what’s cool,” focus on telling a good story with good characters. This is puzzling. If you can already be one of the most powerful super-humans on the planet as a solo, what is the benefit to combining to a hulk sized version and sharing the role? I don’t mean to poop the idea before I’ve read it, but to me I liked the original Firestorm series because it was two opposite characters (Ronnie and Stein) who had this great reaction in each others company, as people, and an even greater one when they chose to become Firestorm. Their internal jokes and comments in combined form were what hooked me on the series and made it all so fresh. While this idea could take off still and it will be great seeing my Peter Parker – Ronnie, back in print, at first read it feels like this is series of the 52 car line-up, waiting under the starters flag facing the wrong way. Like others before me, I’m disgusted by EVS’ Stein-bashing. I’ll give the new series a shot, however, as I can’t accurately judge the comic’s quality (or lack thereof) until I read it for myself. Besides…how long could it be until Stein shows up in the new series, anyway? I thought the whole point of using Ronnie and Jason was to have a nerd and a jock stuck working together and disagreeing on everything. If they are “best buddies” already, then there’s no conflict. I don’t have a specific problem with the other changes discussed here, although the Stein-bashing is pretty short-sighted. Does this mean the entire post-Brightest Day countdown to explosion thing is being dropped? I feel pretty ripped off and not inclined to buy this series, if that’s really the case. Wow! Thanks for all the comments! You match-heads totally rock! Overall, I’m still looking forward to this new book. I like Ronnie and Jason both. I really like Gail Simone’s writing and Yildiray Cinar’s art. I like Ethan Van Sciver as an artist and am interested to see what he does as a co-plotter. I know this new Firestorm book sounds like a large departure from the Firestorm we know. But for me it boils down to this … I trust the creators involved, so I gotta believe we’re in for a fantastic book. I totally respect and support they want to take Firestorm in a new direction. I was initially surprised by some of Ethan’s comments in the Comicbooked.com interview regarding Professor Stein’s involvement with Firestorm. I contacted Ethan Van Sciver via Facebook and asked him about Professor Stein. I said his comments about Professor Stein sort of surprised me and some other fans. It made it sound like he never liked the Professor as part of Firestorm. Was that correct? Ethan responded that was incorrect. I was relieved to read that. I imagine in the interview Ethan was just talking in relation to his vision for the character, not the history of Professor Stein. I know he’s a big Firestorm fan, so it would be hard to like the character but not the Professor. Again, I’m excited about the new book. Hopefully in a few months we’ll all be ranting that we have to wait a month between each amazing issue! I know I’m coming late to this party, but I have to say that I’m kind of surprised by the — well, “anger” isn’t the right word, maybe “cynicism” is — from the Firestorm fans for the latest in a series of really stupid and insulting statements regarding another DC reboot plan. See, sometimes I forget and think I’m the only irritable crank on the internet, and it’s great to be reminded that there are lots of like-minded individuals out there, ticked off at the same things that are ticking me off. I am still being a bit cautious about this reboot. I want the characters to stay true to what made them work, while also being modernized. On a Firestorm note, it seems every time we have a new Firestorm series, they always change everything. It’s a little frustrating at first. First, when we got Jason I was ready to see Ronnie being highlighted again. (Mind you, Jason is now accepted by me as a big part of the FS mythos) And now, I was interested in a Ronnie/Jason partnership after Brightest Day, and now we get this. It’s like everything in Brightest Day with Ronnie, Jason, Martin, and Deathstorm was a waste since they are starting over. But hopefully I am answering my own question when I mentioned I accepted Jason over time. Haven’t seen any Flashpoint issues…does anyone know if this event will cause the new universe, or will it just pop out of nowhere???????? Shag I’m glad you got that bit of clarity from Ethan, as I can see how what he said makes it sound like he doesn’t “get it” (which would be bad news for this book). A big part of Firestorm is the different personalities coming together. I hope the new book somehow doesn’t abandon that and end up dumbing it down. I hope whatever good you see in the team behind the new FOF is realized and that they do “get it” to some degree. And that they CAN sell me on this new vision, just as Jason won me over before. Still, as I said, I remain skeptical. I’m pretty much that way about this DCnU in general, it can be the New Coke of comics if they’re not true to the core of the characters. (Why does Superman need armor?!!?) They need to appeal to all fans, young AND old. I get that people in general don’t accept change very easily and I count myself as one of them but I was happier to think that only one of Ronnie or Jason could control Firestorm at any given time and the other would be his floating apparition guru. I was even okay with each of them having their own look. I’m having a lot of trouble with there being two Firestorms who can merge to create a super monster Firestorm. Sure, it goes along with the whole fusion component of Firestorm but the idea of it just doesn’t excite me. I wholly agree that the best parts of Firestorm historically were the fact that he was comprised of opposites. High school jock Ronnie locked in with a brilliant professor gave an ample supply of tension-filled moments of a fish being out of the water. Even The Brave and the Bold Batman cartoon got it right when it played off the differences between Jason and Ronnie. The drama comes from two guys with opposite strengths and weaknesses who need to work together to overcome their challenges. Blackest Night really focused on that as well so it’s somewhat disheartening to read that they are no longer going to be arguing over the reigns, except perhaps when they become this mega-flametop. I’ll pick up the series, if only to support the character but hopefully they’ll be able to add a bunch of new readers, because they don’t seem too interested in honouring the things about Firestorm that long-time fans have enjoyed. Yeah, Outburst…who knows, on its own this might be a good concept, a good story, but yeah, it would seem that something’s missing. Still we all continued to like Ronnie between Firestorm #100 and his death, and he wasn’t combining with anyone at that time. So it may not be a total deal breaker to have two “solo” characters with Firestorm’s powers, even though the best FS eras were when someone combined with someone else and they had to get along. I just hope this isn’t the end for a classic Firestorm somehow. I don’t want DC to use this reboot to pretend what came before never existed. For all the characters. The main thing I don’t like about this is that it means we’re going to have to contend with the fully-yellow and fully-red costumes of Jason and Ronnie. I think they look terrible like that.